United States Army Veteran David Jacobsen of Cincinatti cranks his crossbow during the 10th annual Ted Epple Veterans with Disabilities Bow Hunt on Saturday morning. Carl Worsham of Lima and Tony Schmitmeyer of Fort Loramie talk during the 10th annual Ted Epple Veterans with Disabilities Bow Hunt on Saturday morning. LIMA — There is a bond between comrades-in-arms, whether it be the Army, Air Force, Navy or Marines. When our veterans who serve our country become wounded and return to civilian life, that camaraderie is often lost. But thanks to the Hunting with Heroes program, dozens of disabled veterans get a chance each year to reconnect and spend the weekend in Allen County bowhunting. 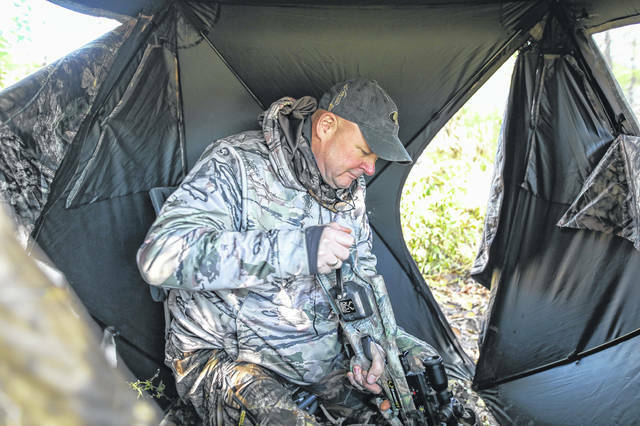 David “Jake” Jacobsen, 56, who served in the U.S. Army, is from Cincinnati and has been to most of the bowhunts. He became disabled at 20 after an automobile accident. He’s an L-2 paraplegic. “I know a lot of these guys — my buddy Tony is sitting right over there and my roommate Becker, who is also an Army vet. This is the only time they have an opportunity this whole year to deer hunt. To provide an opportunity for some people like that that wouldn’t otherwise have done is a tremendous thing, a big step in the right direction. It’s not so much if you get a deer. It’s icing on the cake. What you get out of it is to be with people that are like you doing the things you love to do. That is the real cohesiveness of the thing, and it’s the team building and the friendship that comes out of the thing. A lot of guys treat this like Christmas,” said Jacobsen. He recounted a situation three years ago when one of the men on the disabilities hunt was ready to kill himself. “Because someone talked to him while he was here, we stopped him from doing that. As a direct result of what we’re doing right here, we saved that guy’s life. Each day, 22 vets commit suicide. That’s way too many,” said Jacobsen. 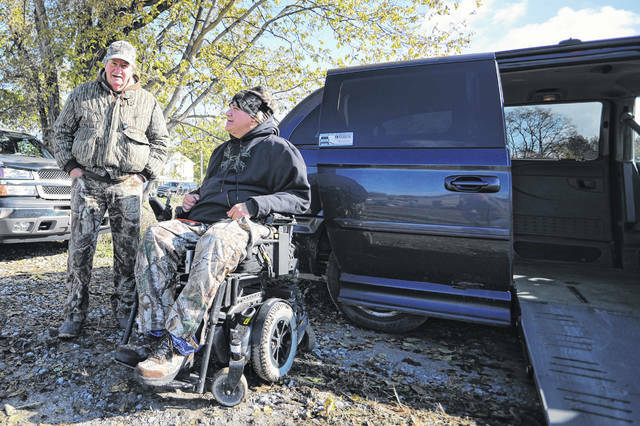 Joe Sawmiller has been organizing the disabilities hunt, now in its 10th year. “We have a misconception that we’re putting on a deer hunt. Actually, we put on a chance for these guys to get together once a year and then we go deer hunting. It’s not about deer hunting. It’s about getting together and getting established friendships and bonds, not only with each other, but with the volunteers too,” said Sawmiller. They had openings for 53 vets. All but eight of them were able to make it. “It’s a lot of fun. We play the game with them all of the time, and everybody ribs everybody else, but we all know we’re here for each other. We got their backs. We give them an opportunity just to get outside,” said Sawmiller. Some the participants can’t afford to do this on their own, and Sawmiller is thankful for the many sponsors they have to make this event possible. Each year, the Elmview Pub sponsors the SOS Project, which helps raise money for the disabilities hunt. Other sponsors include Ford Motor Company, UAW Local 1219, Nutrien, INEOS and the Spencerville VFW. “Husky Energy allows us to hunt here for this weekend, and we hunt over at the tank plant, which is where we originally started, and we hunt out at Kendrick Woods. We’ve got a couple of private farms out there on the east side of town where we’re allowed to hunt on, so we have spots for 53 people. So it’s grown a lot in 10 years from originally just having eight hunters,” said Sawmiller.